I've had a good number of people ask me if I had prints of this particular piece and damn it all, I gave in. I hope you're happy... I'm happy about it. So I mean that sincerely. 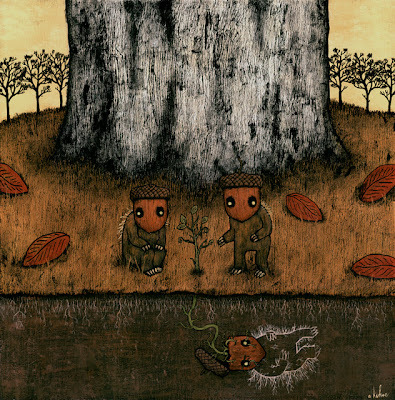 I think these acorn guys will be running about nimbly wimbly in upcoming pieces as well so keep an eye out. I'm now getting prepared for my trip to Chicago next week. I have a friend in Chicago that says he feels like the wind is punching him in the face with cold, leather gloves... in so many words. My god. Plus it's supposed to snow that weekend so driving there should be great fun. Pray for me. Oh, and sometimes the html pages don't load up on your browers right away, so if you don't see it, simply refresh the page and it will appear like magic.